MARS HILL, Maine — Brianna and Chelsea Hartin acknowledged Friday that there are not many things that one has done without the other. The 18-year-old identical twins joined the same clubs, played on the same sports teams, conducted the same volunteer work and even wore identical gowns and hairstyles to their senior prom. So neither twin was surprised upon learning that both had earned an honor part for the Class of 2010 at Central Aroostook High School. Separated by only fifteen hundredths of a point, Brianna Hartin is this year’s valedictorian and sister Chelsea is the salutatorian. 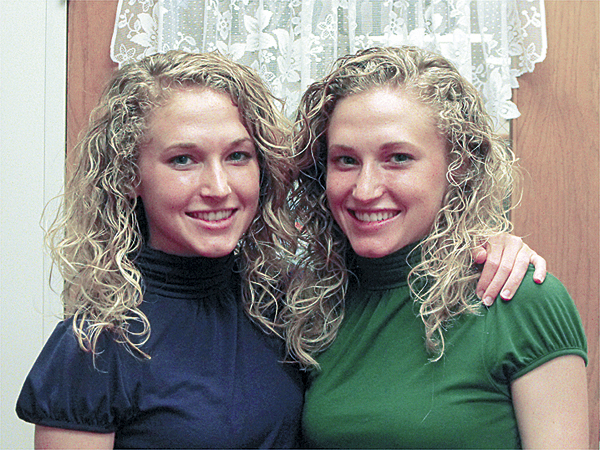 The twins, who live in Mars Hill, are the daughters of Stan and Paula Hartin. Both twins acknowledged that they have pretty much led identical lives since they were born. They have the same likes and interests, the same taste in clothes and an unshakable faith in God that they say is the most important thing in their lives. When they were younger, each twin lost one of their front teeth — one on the left side, one on the right side — on the same day. Sibling rivalry does not exist in their home, both twins said, and never will. The girls’ resumes are virtually identical. Both participated in the National Honor Society and the math team and both played on the varsity basketball and softball teams. Both have earned a slew of the same academic awards. The twins are Seventh Day Adventists and are active in their church community. When the school’s varsity girls basketball team made it to the Eastern Maine title game against Fort Fairfield earlier this year, the twins were unable to play because of their religious beliefs. The time between sundown Friday and sundown Saturday is the Sabbath for Seventh Day Adventists and is reserved for rest, worship and ministry. Both girls are headed to Tennessee in August to attend Southern Adventist University to study premedical biology. And yes, they are going to be roommates. Neither twin could think of anything that one did differently than the other while in high school. The twins plan to spend the summer working at their jobs at the Mars Hill IGA and the Mars Hill House of Pizza. They enjoy their jobs, especially when they see the looks on the faces of IGA patrons who come to the store and encounter one twin cleaning shelves and minutes later see another running the cash register. “It confuses them because they think they are seeing the same person,” Chelsea Hartin said with a grin. They also will continue to volunteer at a church summer camp counseling young girls this summer and will be volunteer coaches at summer sports camps. Both twins said Friday that the transition to college will be easier because they have each other. “College won’t separate us,” said Chelsea Hartin. The Class of 2010 will graduate at 7 p.m. Friday, June 11, in the Central Aroostook Junior-Senior High School gymnasium.